Sherrington called the motor neuron the final common pathway. All the subtle signals converging from several descending tracts as well as afferent input from the periphery are somehow integrated on the motor neuron, which subsequently conducts the appropriate signal out to the muscle. Because so many different pathways converge on the motor neuron, the contribution of any single tract to the final motor act is extremely difficult to determine. Several descending pathways have been shown to effect changes in the activity of motor neurons. The anatomical courses of these pathways have been extensively studied from their origins in various areas of the brain to their synaptic contacts with the motor neurons. The precise physiological roles of these pathways have been studied but the information is limited because of several factors. Principal among them is the fact that most of the work has concerned the motor neurons innervating hind limbs of the cat. Studies on primates have been continuing, but a big problem is the somewhat suspect attempt to wed the neurophysiology of the cat's movement performance to the neuroanatomy of the human's. Another problem lies in the fact that a common tool for studying the function of nerve pathways is electrical stimulation. While there seems to be little alternative to this procedure, the meaningfulness of artificially induced volleys of impulses is questionable when one considers that tile natural influences on motor neurons are spatially and temporally varied and probably achieve their effects by virtue of a pattern of impulses rather than a repetitive volley. Recent attempts have been made to study the neurophysiology of movement by recording neuromuscular potentials accompanying spontaneous movement. This is certainly a desirable approach but is also limited by the fact that even simple body movements are neurally very complex. Thus attempts to relate the anatomical and physiological events associated with these movements are difficult and hard to interpret. Nevertheless, much has been learned concerning the role of the nervous system in such activities as walking, running, and the regulation of postural movements. It now appears that there are "pattern generators" or "prewired" groups of neurons within the central nervous system producing a wide variety of basic motor programs. "Command" neurons activate these pattern generators when a particular movement is called for. Here, we will examine some of these pattern generators as well as the role of the brain and its descending pathways in initiating and regulating movement. Electrophysiological studies have shown that the motor cortex resembles a map showing a distorted image of the body turned upside down and reversed left to right. Some motor pathways to the skeletal musculature of the body arise directly from cells within the cerebral motor cortex, while others arise from subcortical areas of the brain and brainstem. Neurons that originate in the cerebral motor cortex. the cerebellum, or various brainstem nuclei that send axon, into the brain stem and spinal cord to activate cranial or spinal motor neurons are called upper motor neurons, Those cranial and spinal motor neurons which actually innervate muscles are the lower motor neurons. The latter include the alpha and gamma motor neurons of spinal nerves. Upper motor neurons are found entirely within the CNS, while the fibers of lower motor neurons are part of the PNS. Upper motor neurons are clustered together to form descending tracts in the brain and spinal cord. Such tracts are commonly named according to their site of origin and the region of their distribution. An example is the corticospinal tract, which originates in the cerebral cortex and is distributed to the spinal cord. Another is the rubrospinal tract. which originates in the red nucleus (nucleus ruber) of the midbrain and is distributed to the spinal cord. The lower motor neurons of spinal nerves are somatotopically organized in the anterior horn of the spinal cord gray matter. In general, those innervating the distal limb musculature are located in the lateral aspects of the anterior horn, while those innervating proximal limb muscles are found in the intermediate region, The most medial group of motor neurons innervates the musculature of the appendicular and pelvic girdles. Upper motor neurons don't simply stimulate lower motor neurons and produce movement. The highly skilled and coordinated movements of which humans are capable would seem to require a more complex and involved system. While little is known of the highly involved and integrated activity which occurs in the brain's neural circuits during even a simple body movement, it now appears that highly coordinated and very complex systems of interneurons regulate the precise timing and sequencing of muscle activity which is observed in such movements. There is also increasing evidence that groups of interneurons cause specific patterns of impulses to fire in the lower motor neurons associated with a given coordinated movement. The central theory is that these interneurons form pattern generators within the CNS which produce the basic motor program. At the spinal cord level the pattern generator is composed of a set of local control centers located in the gray matter. There are neurons within these centers which coordinate muscular synergies and generate timing signals. Command neurons activate these pattern generators when a particular coordinated movement is required. The result of such activation is that the lower motor neurons fire in a properly sequenced and timed pattern to produce a coordinated movement. Identification of specific command neurons for a particular human movement is a difficult process and a speculative one at best. It may be that upper motor neurons from the brain and brainstem function in this respect for voluntary movements and reflex postural adjustments. In some invertebrates, however, the activation of a single interneuron is sufficient to excite an entire coordinated muscle behavior. For example, stimulation of the giant axon of the crayfish produces a coordinated tail flip which propels it away from the stimulus. Similarly, stimulation of the Maunther cells of teleost fishes produces a tail flip propelling the fish away from the stimulus. These cells are part of the reticulospinal tract neurons in the fish and apparently serve as command neurons that activate the pattern generator which carries the motor program for tail flip. It is presumptuous to assume that all movements proceed in accordance with pattern generators and prewired motor programs. Nevertheless, it may be that certain basic coordinated movements of the limbs and trunk may proceed in a very general way under the influence of such programs, while the initiation and fine tuning of the movement requires input from descending and sensory pathways. The upper motor neurons of some descending motor pathways no doubt serve as command neurons for certain movement patterns. Variations in the discharge patterns of these neurons determines the variability of the programmed response. There is evidence that a change in the firing frequency of certain command neurons leads to a change in the intensity of the response. If the coordinated movement involves a postural system, altering the firing rate alters the magnitude of postural adjustment. If a locomotor system is involved, the frequency of the movement cycle will vary with changes in the frequency of command neuron firing. Other command neurons produce the same motor pattern regardless of their firing rates. Their role seems to be simply turning the program on and off. Still others may regulate the magnitude of the programmed response. Most of the vertebrate work involving motor programs has dealt with locomotor activity in the cat. Perhaps we can get a feel for the intricate features of such programs by an examination of this work. Removal of the telencephalon (cerebral hemispheres) and the rostral portion of the thalamus in an acute cat preparation remarkably leaves the animal with practically normal locomotion. It can walk spontaneously on its own and it can be forced to run by electrical stimulation of a region in the subthalamus called the subthalamic locomotor region (SLR). However, spontaneous walking movements cease in acute preparations where the brainstem is sectioned caudal to the subthalamus but just rostral to the midbrain. This is a mesencephalic preparation, meaning the highest intact brain component is the midbrain or mesencephalon. There are several advantages to the study of locomotion in such a preparation. Perhaps most important is that relatively normal locomotor movements can be initiated by the electrical stimulation of an area in the tectum of the midbrain called the mesencephalic locomotor region (MLR). 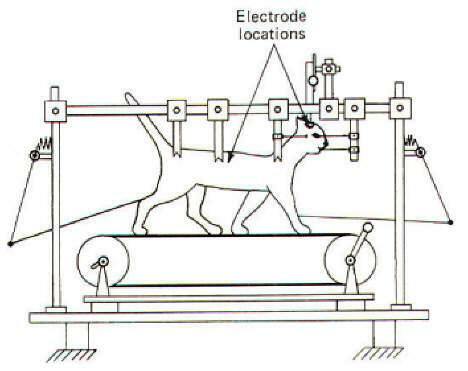 Such a cat preparation can also be placed on a treadmill to facilitate natural movements while its head is fixed in a stereotaxic apparatus enabling the experimenter to conveniently stimulate various brain stem areas and observe the results (Fig-1). Walking and running movements in a mesencephalic cat are similar to those observed normally. A single step cycle is accomplished when a limb touches down, lifts off and moves forward, and then touches down again. 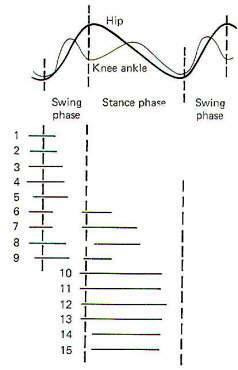 The step cycle is composed of a stance phase (limb in contact with the ground) and a swing phase (limb lifted off and moving forward). Muscle group activity during the step cycle proceeds in a logical order. At the end of the stance phase, when the limb is at its most caudal position, the flexors become active, lifting the leg and initiating the swing phase. During the swing phase, the relaxation of the flexors combined with onset of extensor activity and inertia all propel the limb forward. Because the extensors begin to contract prior to the stance phase, the limb is able to support the weight of the body as the limb touches down. Extensor activity continues throughout the stance phase until just at the end, when it begins to diminish and is replaced by increasing flexor activity preceding another step cycle (Fig-2). Increasing the stimulation of the MLR causes an increase in the stepping frequency of the mesencephalic cat. However, this increased frequency is apparently due to an increased muscular force moving the treadmill faster with the rate of stepping increasing indirectly to keep up with it. The increased force is apparently due to the increased recruitment of more alpha motor neurons and motor units rather than to any increase in the firing rates of the currently active units. Thus MLR stimulation directly increases the level of muscular force and indirectly the stepping frequency. If the level of MLR stimulation is held constant and the treadmill is either speeded up or slowed down by the experimenter, the stepping frequency of the mesencephalic cat will speed up or slow down accordingly. It is very interesting to note that while stepping is a complex process involving a repetitive sequence of muscular contractions and relaxations with very precise timing, all that is necessary to get it started is to stimulate the MLR in the mesencephalic cat or the SLR in the subthalamic cat. Thus it seems likely that stepping is an automatic process with a central program controlled by a pattern generator in the CNS. Stimulation of the MLR and SLR activates this program and can in fact vary its intensity. The pattern generator for stepping with the hind limbs of the cat appears to reside in the spinal cord. In chronic cat preparations where the lower thoracic spinal cord was completely sectioned shortly after birth. the animals are capable of a full variety of stepping gaits in accordance with the speed of the treadmill. Thus it seems likely that the pattern generator resides in the spinal cord, at least for hind limb movements. Transection of the spinal cord at a high enough level to include the forelimbs (high cervical) does not ordinarily allow for satisfactory locomotor movements. and thus has not been adequately evaluated in this regard. Signals arrive at the pattern generator in the spinal cord both from the periphery and from supraspinal levels. The Ia afferents from muscle spindles monosynaptically stimulate homonymous alpha motor neurons and thus influence the activity of an ongoing motor program. Similarly, signals arriving at spinal cord interneurons from supraspinal levels via upper motor neurons also exert an influence over the performance of a motor program. It is important to note that the stretch reflex is not always productively useful at all times during the step cycle. Thus it is not surprising to find that the sensitivity of the reflex is varied cyclically with the step. It is "tuned in" when the reflex is useful and "tuned out" when activation of the reflex would be counterproductive to a particular phase of the step cycle. Muscle spindle sensitivity can be controlled by the pattern generator since it can apparently direct the timing of both alpha and gamma motor neuron firing. Thus during the phase of the stepping cycle when a muscle is passively stretched (i.e., the gastrocnemius at the end of the stance phase) the sensitivity of its muscle spindles is decreased. This prevents the stretch reflex from activating muscle contraction during the "wrong" phase. Thus the spindles are "tuned out" when the muscle is passively stretched and "tuned in" again when the muscle becomes active during the step cycle. Let's now examine the descending motor pathways which influence motor activity. Descending motor pathways are defined as those which initiate or modify performance and which originate in the brain. While several tracts have been anatomically identified and physiologically studied, it is still speculative to assume that we fully understand what contribution any given tract makes to a spontaneous movement. To electrically stimulate a descending tract, observe a movement response, and then assume that the observed response represents the function of the tract is surely dangerous. The tract may have other, perhaps more important, functions to perform which are not observed in the movement. Or possibly the participation of the tract in a spontaneous movement of the same kind may be of considerably different magnitude. Nevertheless, stimulation of descending motor pathways does produce activity in groups of flexor and extensor muscles. Examination of these effects may give us valuable clues as to the role of these pathways in normal spontaneous movement. 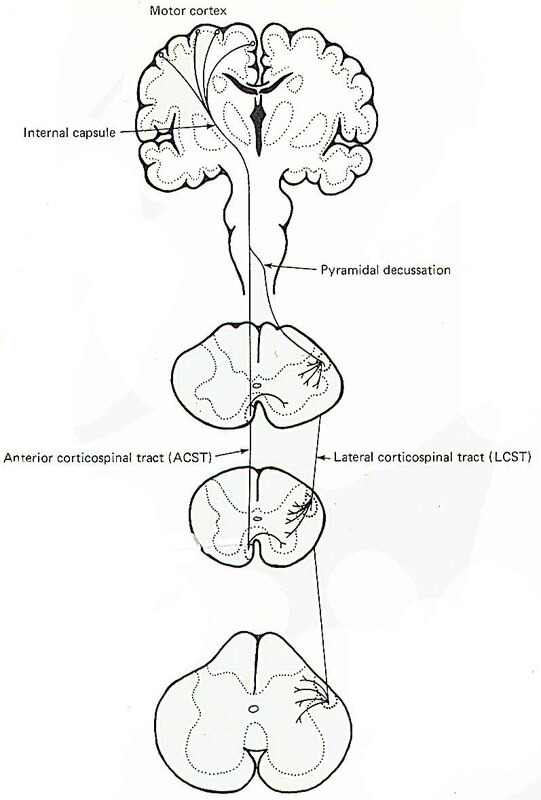 The corticospinal tracts are often called the pyramidal tracts because they form pyramid-shaped enlargements on the anterior surface of the medulla. They are primarily concerned with controlling skilled movements of the distal extremities and, in particular, facilitation of those alpha and gamma motor neurons which innervate the distal flexor muscles (Fig-3). There is also evidence that they inhibit distal extensor muscles. The upper motor neurons of these tracts originate in the precentral gyrus of the cerebral cortex. From here their fibers pass without synapsing all the way to their terminal destinations in the spinal cord gray matter. 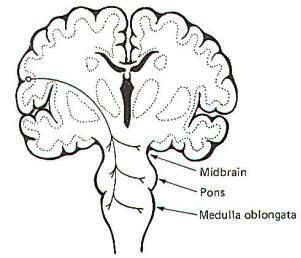 After leaving the cortex, the fibers descend through the posterior limb of the internal capsule, through the middle portion of the cerebral peduncles to the basilar portion of the pons, and on into the medulla oblongata where they form the medullary pyramids. Most of the fibers (85 percent) cross over (decussate) to the opposite side in the pyramidal decussation, where they continue to descend in the lateral funiculus of the spinal cord as the lateral corticospinal tract (LCST). The tract descends all the way to sacral levels with fibers continually leaving it in order to synapse on interneurons in laminae IV, V, VI, VII, and VIII. Some even synapse directly on alpha and gamma motor neurons in lamina IX (Fig-3). Those corticospinal fibers which do not decussate in the medulla continue descending on the same (ipsilateral) side of the cord and become the anterior corticospinal tract (ACST). This tract does not extend below the midthoracic level. Fibers leave the tract at various levels to cross over in the anterior white commissure to synapse on interneurons in lamina VIII. Electrical stimulation of the cortical areas from which the corticospinal tracts arise excites many more motor neurons to distal forelimb muscles in the baboon than it does motor neurons to proximal muscles. In fact, proximal limb muscles are frequently not activated at all by cortical stimulation. The more dextrous the distal muscles are, the greater effect the corticospinal tracts seem to have on their activity. Following cortical stimulation, larger EPSPs are seen in the motor neurons to skilled distal flexors than are observed in proximal muscle motor neurons. Studies have shown that following complete bilateral pyramidal tract section in monkeys, they are still able to perform a wide range of activities using the body and limbs and are able to walk and climb in a normal manner. Their principal and most dramatic shortcoming is in their ability to perform skillful manipulative tasks with the fingers and hands. In similar tests of manipulative skills in monkeys with unilateral pyramidal tract sections, it was found that skilled movements in the affected hand were dramatically reduced relative to the normal hand. However, the animals were still able to move the whole limb around the joints of the pectoral and pelvic girdles with no trouble and they showed no difficulty in performing combined movements of the limbs and the body. Thus it seems probable that the corticospinal system is directed effectively to facilitating movements requiring skill and dexterity of the distal musculature. This tract is composed of fibers originating in the precentral gyrus of the lower quarter of the motor cortex. The descending fibers leave the motor cortex and pass through the posterior limb of the internal capsule just anterior and medial to the corticospinal tract fibers. From here they continue on through the cerebral peduncles just medial to the corticospinal tract fibers to terminate in the motor nuclei of cranial nerves III and IV in the midbrain; V, VI. and VII in the pons; and IX, X, XI, and XII in the medulla. The corticobulbar fibers from one side of the brain project to the motor nuclei on both sides of the brainstem (Fig-4). 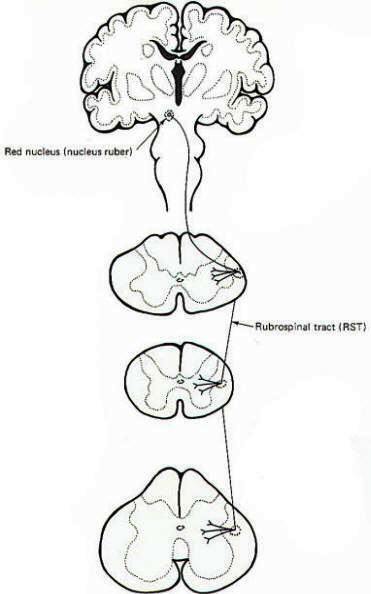 The fibers of this tract originate in the red nucleus (nucleus ruber) of the midbrain. They cross over near their point of origin and descend contralaterally in the lateral funiculus of the cord adjacent to the lateral corticospinal tract (Fig-5). 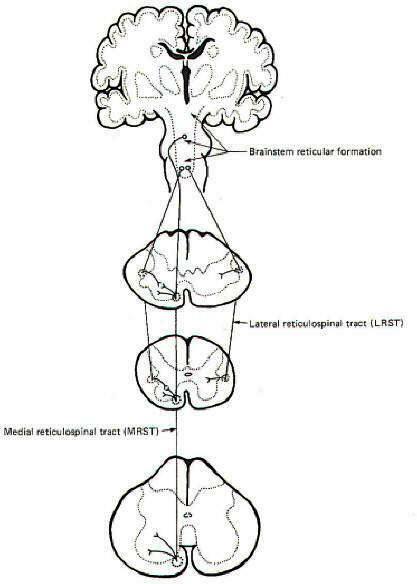 Before leaving the brainstem, some fibers of the tract enter the reticular formation. As the tract descends through the spinal cord, fibers leave it and synapse on interneurons in laminae V. VI. and VII. Cells in the posterior portion of the red nucleus give rise to axons influencing motor neurons of the neck and upper limbs. while fibers from the anterior portion descend to lumbar levels where they influence lower limb muscles. Ablation studies in which the tracts are experimentally cut have shown that the corticospinal and rubrospinal tracts have somewhat similar effects on the motor neurons. When the rubrospinal tracts of monkeys were damaged on top of earlier pyramidal tract sections. the loss of skilled control of the distal musculature became even more severe and yet there was little or no loss of control in the proximal muscles. Lawrence and Kuypers concluded that a laterally placed group of descending fibers, which they called the lateral system (corticospinal, rubrospinal, and possibly other tracts), is primarily concerned with delivering cortical control to the distal limb musculature. Independent electrical stimulation of the intact rubrospinal tract facilitates flexor and inhibits extensor alpha and gamma motor neurons to the distal muscles. Considering that the red nucleus receives input from the same area of the cerebral cortex as the corticospinal tracts, the similarity of their actions may not be too surprising. The red nucleus also receives input from the deep cerebellar nuclei and possibly the basal nuclei as well. Nevertheless, as previously pointed out, the reader should bear in mind that ablation and electrical stimulation studies give us an incomplete picture of the function of a descending, or for that matter any, tract in the central nervous system. Further, whatever information is obtained relates to the unnatural experimental situation and not necessarily to normal function in the intact spontaneous animal. The reticular formation is an indistinct group of cell bodies clustered in the core of the brainstem. They don't form distinct nuclear groups like those found elsewhere in the CNS. The reticulospinal tracts represent groups of fibers which originate in the reticular formation and descend into the spinal cord (Fig-6). Those fibers which originate in the medullary reticular formation show both a crossed and an uncrossed component which descend in the lateral funiculus of the spinal cord as the lateral reticulospinal tract (LRST). The descending fibers in this tract periodically leave and synapse principally on interneurons in lamina VII. Those fibers arising chiefly in the pontine reticular formation represent the medial reticulospinal tract (MRST). Fibers in this tract descend ipsilaterally in the anterior funiculus to all levels of the cord, periodically leaving to synapse in laminae VII and VIII. The reticulospinal tracts exert both somatic and autonomic control. The somatic control involves both facilitation and inhibition of alpha and gamma motor neurons at all cord levels. Some cells in the medulla and medullary reticular formation (the inhibitory center of Magoun and Rhines) exert a strong inhibitory effect through the reticulospinal tracts on all types of alpha and gamma motor neurons. On the other hand, cells in the upper medullary and pontine reticular formation exert a strong facilitatory effect on alpha and gamma motor neurons. Accordingly, the idea of an "inhibitory" and "excitatory" center in the brain stem has been postulated. It may be that many of the modulating effects of the cerebral cortex and the cerebellum are mediated through these "centers" since both feed into the reticular formation. The reticulospinal tracts influence autonomic effects through their influence on preganglionic neurons in the intermediolateral horn of the spinal cord gray matter. Most of these fibers are derived from the lateral reticulospinal tract with a smaller number coming from the medial reticulospinal tract. It is undoubtedly simplistic to assume that the reticulospinal tracts are the only descending tracts regulating autonomic control. Some fibers of the corticospinal and vestibulospinal tracts have also been implicated. 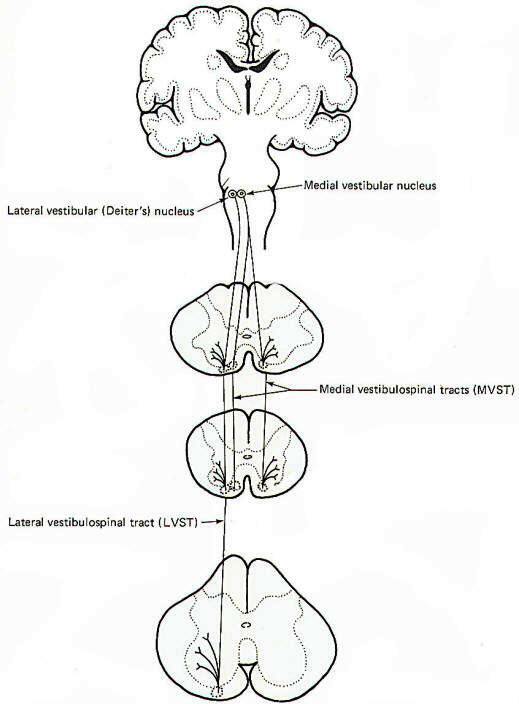 The vestibulospinal tracts originate in the vestibular nuclei of the brainstem. Those fibers originating in the lateral vestibular (Deiter's) nucleus descend ipsilaterally in the anterior funiculus and form the lateral vestibulospinal tract (LVST) (Fig-7). The fibers of this tract terminate in laminae VII, VIII, and IX at all levels of the cord. The vestibulospinal tracts facilitate extensor and inhibit flexor alpha and gamma motor neurons. Input from the vestibular apparatus to the vestibular nuclei via cranial nerve VIII presupposes an antigravity or postural role for the lateral vestibulospinal tract. Activity in this tract is also influenced by input to the vestibular nuclei from the cerebellum. Arising from the medial vestibular nucleus are the fibers of the medial vestibulospinal tract (MVST). While there is a small crossed component, most of its fibers descend ipsilaterally only as far as the midthoracic cord, where they too synapse in laminae VII, VIII, and IX. The function of this tract may be similar to that of the lateral vestibulospinal tract, but its precise role is largely unknown. The descending fibers of this tract arise in the interstitial nucleus of Cajal (an accessory nucleus of III) in the tegmentum of the midbrain. They descend ipsilaterally only to the cervical level of the cord, where they synapse in laminae VI, VII, and VIII. The tract may play a role in reflex movements of the head and neck in response to visual stimuli, but its function is largely unknown and probably more complex. The descending fibers of this tract arise chiefly in the tectum of the superior colliculus. Some of them decussate and others don't. In either case they only descend to cervical levels where they synapse in laminae VI, VII, and VIII. The tract has been implicated in mediating visual reflexes but, again, its function is largely unknown.